Swachhcoin wants to revolutionize the waste management industry using blockchain technology, IoT, adaptive intelligence, big data, and other advanced technologies. The goal is to maximize the creation of value from global household waste. Obviously, waste is becoming an increasingly important issue in our modern world. We’re generating too much waste, and all of that waste either needs to be repurposed or safely stored. Swachhcoin aims to address this issue while increasing profitability and efficiency in the waste management industry. The ICO for Swachhcoin Tokens is expected to get underway in Q2 2018. The company’s private sale for tokens began in April 2018. 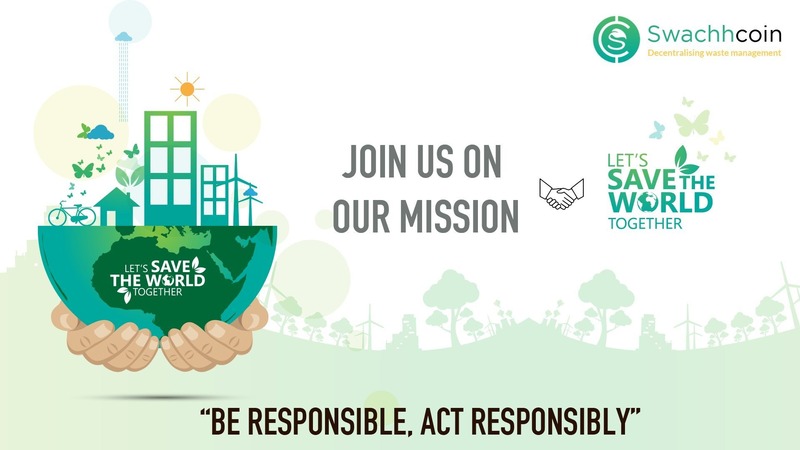 Swachhcoin brands itself as a non-profit organization. They want to make the existing waste management industries efficient and capable of acting as a provider of service and developer of technology in this sphere. Not only does it intend to work with industries, but, they also plan to develop an ecosystem whereby they can influence the waste management habits of individuals on a mass scale. Swachhcoin wants to incentivize people monetarily who puts to dispose off the waste properly. It wants to build an ecosystem for this purpose utilizing IoT, blockchain, adaptive intelligence, and other technologies. The ecosystem will revolve around the Swachh tokens. According to Swachhcoin, the users of the platform will receive monetary incentives in exchange for managing their waste properly. The processes waste will lead to at least 20 different products or outputs. The platform also believes that this initiative will gradually change the way how waste is disposed all over the world. The platform’s decentralized app, or SWAPP, is the user interface that includes a wallet and information about the nearest SWBIN location, giving users an easy and convenient disposal experience. SWBINs are customized waste collection bins designed by Swachhcoin. These bins will have “various features that enable highly effective waste disposal,” explains the official whitepaper. The Swachhcoin Internet of Things network is a customized IoT application designed to use IoT sensors to optimize the waste management industry. SWATEL is “the customized application of adaptive intelligence designed and mofieid for waste processing industry,” explains the whitepaper. The platform will be based on blockchain technology. As you can see, all of these features are vaguely defined. The information above comes straight from the whitepaper. There are few technical details about how the platform seeks to use these technologies. Over the past few years, interest in cryptocurrency has grown exponentially. Total market capitalization at the beginning of 2018 exceeded $500 bln. Currently, the most capitalized cryptocurrency is Bitcoin. The market capitalization for the top five cryptocurrencies exceeds 70% of total market capitalization, and the total number of cryptocurrencies and tokens now exceeds 1500. Comments: The market is showing growth, which implies an opportunity for the project to take a market share. Swachhcoin is led by founder and CEO Aditya Kumar along with co-founder and COO Prashant Chaturvedi. Aditya is a Kolkata, India-based entrepreneur with a background in earth sciences and environmental services. He created Swachhcoin in 2016. Other listed members of the team include Aditya Vikram Singh (Chief Financial Officer), Siddela Sarat Kumar (Chief R&D Officer), Naman Jain (Chief Marketing Officer), Kuruva Saiteja (Chief Relations Officer), Deep Ranjan Gupta (Chief Technical Officer), and Hemant Verma (Chief Strategy Officer). Swachhcoin is a unique blockchain-powered attempt at micromanaging wastes from households and industries and efficiently converting them into useful products. These products, at the end of the process, will be of higher economic value. The team intends to delve into the realm of, but not limited to green-energy, fertilizers, and power generating gases as of now. But given the rapid progress of fundamental research on efficient product conversion, the team looks forward to adapting and better the existing working technology.